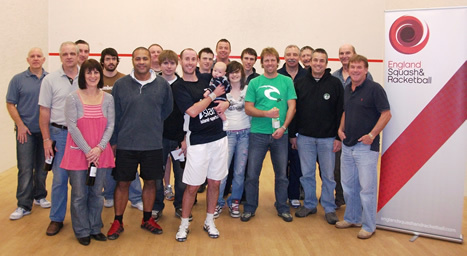 SOUTH WEST RACKETBALL CHAMPIONSHIP A MASSIVE HIT! Devon and Exeter SRC played host to the Regional Racketball championship last weekend and event organisers were very pleased with its success. The tournament saw a huge entry of over 70 competitors across 4 different grades with many individuals playing for the first time in competition. The D Grade was aimed at recreational players, whilst the C Grade moved up a level to social club standard. The B grade addressed the needs of serious club standard competitors with the A grade forming the main South West Championship event. Some great matches included former National O40 Ladies Champion Bev Vatcher from Dorset narrowly overcoming Exeter based Carol Hayman 11-9 in the fifth game. In the main championship there was a superb collection of top county and nationally ranked players throughout, with the top four seeds making their expected position in the semi-finals. The first semi-final was between current Devon Champion Matt Baker and the fast improving Christian Turner, this turned into a very hard fought match with Baker narrowly prevailing 3-2. In the opposite side of the draw a contrast in styles saw youngster Gavin Perrett from Torquay take on the talented Mike Gregory from Devon and Exeter SRC, despite some fantastic retrieval from the younger player the experienced Gregory won a tight contest 3-0. The final was a clash between old rivals Baker and Gregory who in the past have contested many Squash finals in various competitions, on this occasion England Number 9 Baker got off to a flying start against England Number 16 Gregory and never looked back, using the two wall boast to great effect to move his opponent forward. Picture attached includes all grade winners and finalists including Matt Bakers newest arrival Thomas! !